I am a holistic nutritionist, herbalist, raw food chef – location independent and a military veteran. Yes I do work on the road but have not volunteered in an official capacity yet. 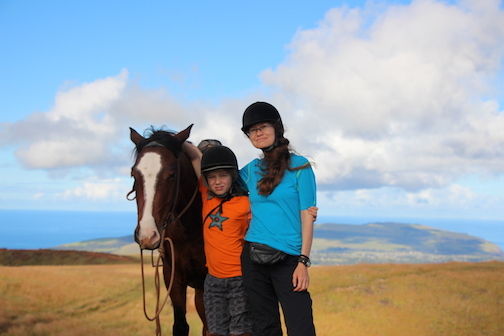 Easter Island and France have been our most challenging so far due to food allergies that we have. Our bivy bags have been the most useful in Cusco during the winter when it gets cold and there were no heaters in our apartment. We have not experienced least useful yet. The opportunity to experience how other people eat – we are foodies, the different music, the history. We love meeting new people and experiencing their customs. The challenges are finding enough variety of food for a growing boy who has allergies making his diet vegan gluten free. Sacrifices are not something we have seriously felt yet. We have learned that we can find food anywhere, that we need to just go and enjoy. Embracing it more, getting rid of more stuff but accepting what we do need. That we do not have to fit any mold. Remembering that there is not a rush to see everything as this is not a time limit vacation. My advice is ignore the news as it only focuses on the bad and know that there is far more good out there than in North America. Trust in your ability and do not worry so much about the kids. In this respect I do believe they can adapt only because they will always have you as their stability and routine. Traveling teaches far more in social behavior. Our long term journey has not ended. If my son has his way we will be journeying for 10 more years. He has now taken to history with help from reading so now we must travel to Greece, Rome etc to solidify what he has read. Read more about Rhoni on her blog, Living Our Life, or follow her on Facebook.